Before ED recovery, I had never met a single woman who was excited about getting her period. The experiences seemed to range from nuisance to discomfort to pain to outright debilitating. One of my best friends got so sick with every single cycle that she missed at least two days of work EACH MONTH. So I always considered myself pretty lucky that my periods were *irregular*. I never thought too much about what was causing the arbitrary intervals of my cycle, but wasn’t particularly surprised when I was officially diagnosed with PCOS a couple of years ago (irregular periods are a common symptom) when I moved and switched to a new OBGYN. In addition to this diagnosis, she told me that if I wasn’t having a period naturally at least every 3 months, I needed to chemically induce one, to avoid serious health consequences including osteoporosis and uterine cancer. At that point it had been about 10 months since my last cycle. I decided I could probably tolerate the inconvenience, discomfort and expense (that one’s a rant for another day) 3-4ish times a year in the interest of preserving my longer term health. Now that you know more than you probably wanted to about my plumbing, let me get to the actual point of this story. 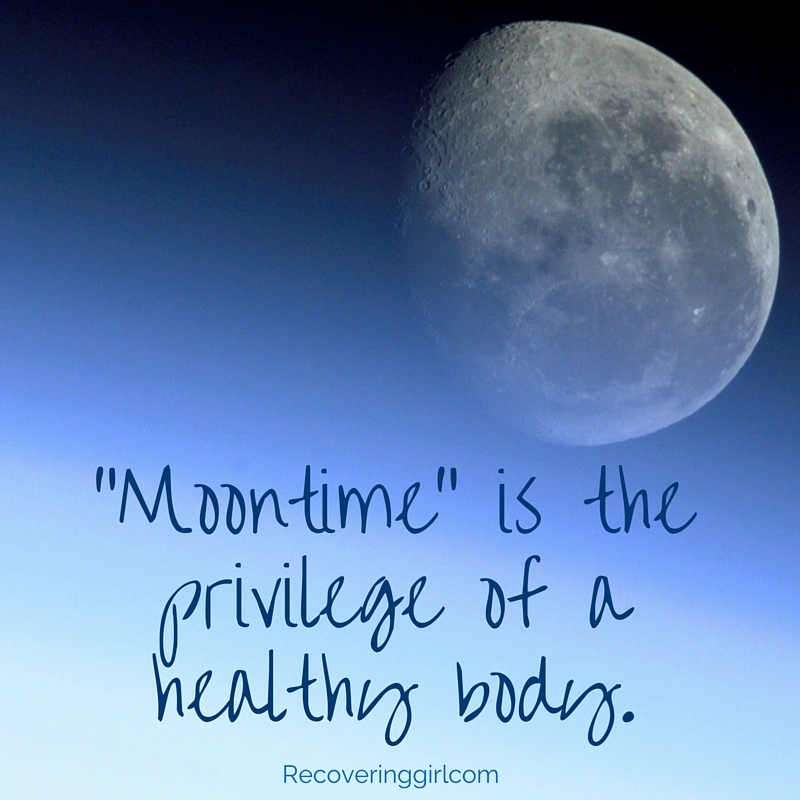 The treatment program I participated in used to be designed around Eating in the Light of the Moon by Anita Johnston and there was a whole chapter devoted to “Moontime,” (insert heavy sarcasm font) that magical time when women “connect to the rhythms and pulse of life” and gain access to the “special link to emotions and the wisdom inherent in nature’s cycles.” Of course this notion was so completely different from what we are taught by a society that doesn’t value soft femininity and intuition, that it initially sounds completely ridiculous. I laughed so hard the first time I read the chapter with a group that I almost passed out from lack of oxygen. But over time, I learned more about how my body operates and the masterful mechanisms at work every second of my life, through every breath I take. I learned that the ability to create life is not just something that happens, it’s the female body’s superpower. Just to be clear, this doesn’t mean I’m obligated to have babies, just because I CAN. The point is that the menstrual cycle is a signal from the healthy body that it is strong enough, capable of sustaining life; even if that’s just my own. Looking back at the gaps I previously considered to be arbitrary, I realized that the length of the time between cycles was directly correlated to where I was in my disorder. I had longer gaps when I was starving myself on extremely low calorie diets, and I had longer gaps when I spent my days restricting and my evenings bingeing, and I had longer gaps when I was cutting out carbs and eating protein to the point of numbness at every meal. Once I stopped dieting, got a handle on the binges, significantly reduced my stress level and started paying more attention to getting enough balanced nutrients (carbs, fats and protein) to support my body’s needs, I suddenly settled into a fairly predictable, regular, 45 (ish) day cycle. I still have a knee jerk reaction of annoyance, especially when the timing happens to coincide with New Year’s and Valentine’s Day, but then I am also filled with gratitude for my healthy body, gratitude for the reminder that my body can handle me not being perfect, gratitude that my body knows what to do, as long as I hold up my end of the bargain. This entry was posted in Uncategorized and tagged eating disorder recovery, ED, menstrual cycle, moontime, period, recovery, tmi. Bookmark the permalink.